...and he’s on it: "If people don't come for this, they're not going to come out." "If people don't come for this, they're not going to come out." Agreed, Mike. For the record, though it may appear so, I'm not on the payroll at Milwaukee IndyFest, but perhaps I should be. 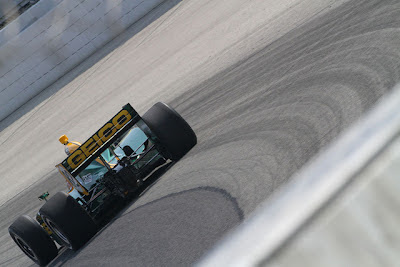 Fact is, I'm just incredibly impressed with how Michael Andretti and his Andretti Sports Marketing group are going about reestablishing the IZOD IndyCar Series race at The Milwaukee Mile—100% effort (There is no 110%, BTW), from what I can see. What blows me away: The SM engagement—previously detailed here—ticket prices reduced 38%, plus this killer list of events and activities that make IndyFest a complete Father's Day weekend destination, for all ages. Oh, by the way: FRIDAY GRANDSTAND ADMISSION IS FREE. Seriously? You don't have to be a die-hard open-wheel fan to get enjoyment out of your time at Milwaukee IndyFest, which is an awesome recipe for a successful event. Props to Mike for bringing the festival atmosphere of a street race to an oval. Hope the hard work pays off, Mike (like he's reading this), you've earned a good result. The racing? Oh, that'll take care of itself.